The VW Rabbit Cabriolet had a built-in roll bar below the convertible top. 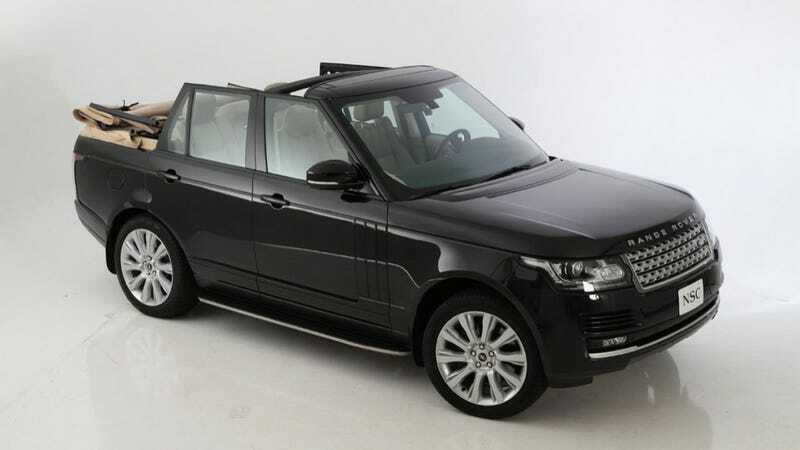 This 2013 Range Rover was made into a convertible by NCE and has the same thing. That means that this is a modern VW Rabbit Cabrio. Neat! I like the newest Range Rover. It's ultra-rugged and ultra-luxurious, two things that a Range Rover has always been and will always be. But this convertible version makes the Nissan Murano CrossCab look like a good idea. I mean, just look at that rear window. Think they could have made it smaller? To my untrained eye, the top looks like it was partially built by children with some adult instructions because certain parts look much better than others. It's an insane idea. Why would anyone want a Range Rover convertible? Who would want a Range Rover convertible. An Evoque Convertible makes some sense. This one? Not so much.